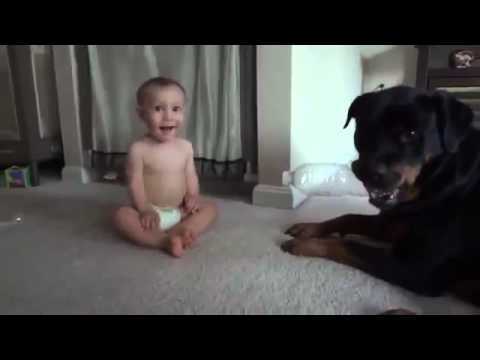 Funny video of the Rottweiler named Roxy and a baby playing with plastic bottle, this video shows the best nature of Rottweilers, they are very good with children if trained well. They must be taught, however, what is acceptable behavior with children. Rottweilers have a natural instinct to herd and may bump children to herd them. In addition, some Rottweilers have a strong prey drive and may get overly excited when children run and play. However you should always supervise your Rottweiler when he's around children.